The KIRO OASIS orthopedic seat cushion provides sitting pain relief from sciatica, fibromyalgia, ischial pain, bursitis, and other painful sitting conditions. It promotes proper posture and relieves the buttock pain and leg numbness that people experience in office chairs, while driving, in airplane seats, or when sitting for a longer duration. Foam and gel cushions compress and "pack-down" according to your weight distribution. The KIRO OASIS cushion does not pack down. It uses patented fluid 3D Flotation technology, which has 3 different layers - fluid, air, and foam. The fluid layer, which is closest to the body, fills in all available space and increases the direct contact/support area between your body and the cushion. KIRO OASIS DISSIPATES PRESSURES & ELIMINATES CIRCULATION-AFFECTING "PRESSURE HOTSPOTS"
With the help of the increased support area and the 3 layers, where each layer responds differently under pressure, the KIRO OASIS cushion dissipates pressure effectively and eliminates the pinching "pressure hotspots". Waterproof: The cushion can be easily cleaned with mild cleanser wipes. Absence of discomfort: The KIRO OASIS cushion feels different than other cushions. The best way to evaluate it is the absence of discomfort after using it for a while. Clinically tested: The fluid 3D flotation technology has been clinically tested at Stanford University Hospital. 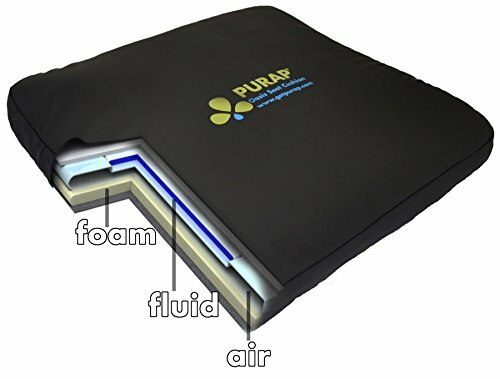 If you have any questions about this product by PURAP, contact us by completing and submitting the form below. If you are looking for a specif part number, please include it with your message.